Recently, as I walked across a parking lot, I saw a man I know sitting in a car with the windows down. I waved, but he didn’t respond. Then I realized he was looking in his car’s rearview mirror, watching people behind him on the far side of the parking lot. I spoke to him as I passed, teasing him about looking at life backwards. We laughed, but as I got in my car, I thought about how many people live their lives looking back, wishing for what was, regretting things they did or didn’t do, or words they said or failed to say. But the problem with looking back is you lose sight of what’s ahead. When your focus is behind, you’re likely to make a misstep with forward motion or remain frozen in your current location or situation. Genesis provides an example of a backward-looker. Identified only as Lot’s wife, this woman couldn’t resist one last glance at her former life, and that look back cost her life. She was warned of the danger, but the temptation for one last backwards peek was stronger than the wisdom to move forward. While having a rearview focus on life doesn’t necessarily cause physical death, it can cripple emotionally and spiritually, causing you to stagnate in grief, regret, fear, anger, unforgiveness, or precipitate a return to habits or thought patterns that hold you captive. Forgive – An unwillingness to forgive is like shackling yourself with a ball and chain. Unforgiveness is a heavy weight to drag through life. It slows, if not halts, forward motion. Let go of guilt and regret – Guilt and regret are unhappy twins. They whine and entwine like clinging vines, entangling your thoughts until they bind you into inaction. Catch a vision of your next steps – Half the battle of moving forward is catching a glimpse of the benefits of what lies ahead. Many are resistant to change because they can’t envision the positives of moving beyond their current situation. 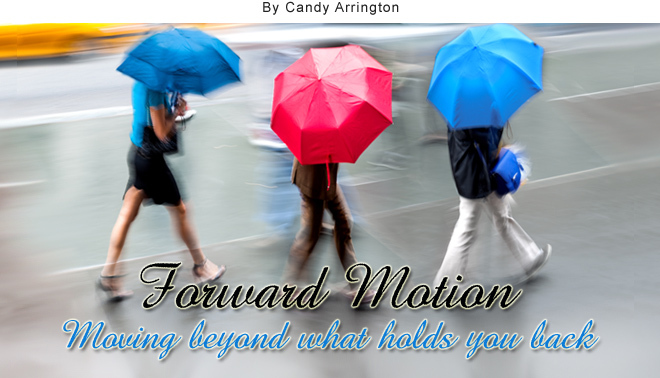 Take time to assess what holds you back and then map out the necessary action required to generate forward motion. Banish fears – Fear is probably the greatest deterrent to making changes and moving on. When what-ifs threaten to sap courage and prevent action, press on, one step at a time. Remember, most of what you fear never happens. Trust God for help – Many aspects of moving forward are impossible without divine help, but your inability is an opportunity to experience God’s strength and power. Don’t allow pride to get in the way of asking for and accepting God’s help. Encouraging advice! I just need to apply these to my way of thinking and living. Enjoyed reading your article. Thanks for sharing. I enjoyed this immensely, Candy……I look forward to another one….Love..